The kindness of cats - I'm not lost, I just don't know where I'm going. Yesterday morning, I woke up and thought I saw a silhouette of a cat in my window. I pulled back the curtain, and Calico-kitty was loafing there. She must have jumped up while I slept, rain masking her sound.. and then when she realized I was sleeping, she let me remain asleep. She was hungry, of course, but not starved to the point where she couldn't wait until I was ready to get up. It was a bit weird, really, since Calico-kitty is not a very nice cat. She came by again today and all she did was hiss at the kittens and eat. Election day tomorrow. Mentally kicking myself for not doing early voting like I did the last few times. Had to ask my aunt for a ride to Eivindvik tomorrow. She agreed to it, so at least I get to go. The library should be open tomorrow too.. not that I need more things to read, but.. Libraries are awesome. Even one as tiny as ours (only open two days a week). Still haven't cast on my socks of the month. Probably going with a quick knit again; the last two months I've been branching out and trying new and scary patterns. 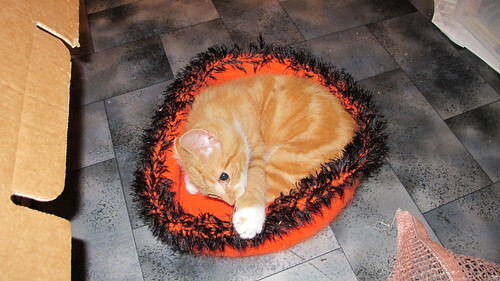 Right now I'm knitting another Kitty Pi cat bed. I did one right at the start of the month and the kittens loved it.